Derek Jeter, the heart and soul of the New York Yankees’ franchise for the last 15 years since his debut in 1995. Jeter has won 5 World Series, 5 Gold Gloves, 4 Silver Slugger awards, and has made 11 All-Star appearances over his illustrious career. So you ask, how does New York let a player of that caliber reach free agency? I can’t answer that question, but I’m really glad they did. History has been shown to repeat itself. On January 3, 1920, New York pulled off perhaps the greatest acquisition in baseball history by acquiring Herman “Babe” Ruth from the Boston Red Sox. Red Sox owner Harry Frazee regretted this deal for the rest of his life, as the Yankees went on to win an astounding 7 World Series titles with Ruth. The Red Sox went 86 years before they would finally break through and win the World Series in 2004. Frazee, a theatrical producer, used the proceeds from the Ruth trade to produce a Broadway musical called “No, No, Nanette”, originally called a non-musical named “My Lady Friends”. The “Curse of the Bambino” was widely blamed for the lack of success for the Boston franchise, until in 2004, the Red Sox came back from a 3-0 deficit against the hated New York Yankees, to win the American League Championship series 4-3. The Sox went on to sweep the St. Louis Cardinals 4-0 to win the World Series. Many feel the “Curse of the Bambino” was broken when the Babe’s piano was found in Willis Pond, in Sudbury Massachusetts. Local legend has it that Ruth, an avid piano player, pushed the upright onto the ice in 1919 during a stay at one of the pond's cabins. Two men who grew up on the pond said they remember setting fire to the piano in 1973 and pushing it into the water. 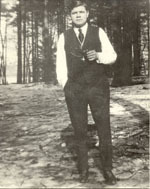 Babe Ruth at Willis Pond, prior to spring training 1918, waiting for his ride into Boston. "I'll see you kids at Fenway Park this summer. Back to Derek Jeter……..The Red Sox could certainly use a player of Jeter’s caliber. Ever since that day in 2004 when he dove into the stands at Fenway Park for a foul ball while the Sox poster boy Nomar Garciaparra watched from his bench with an supposed injury, he has been a fan favorite of Red Sox Nation. Personally, I don’t like the Yankees, but I follow them as closely as I follow the Red Sox. I have always respected Jeter’s character, work ethic, and skills. He may not be the greatest shortstop of all time, but he’s worthy of being included in the discussion. Will he ever leave the Yankees, probably not? But ask any Bruins fan if they thought the greatest athlete in Boston history (do I really need to name him?......Bobby Orr) would ever leave Boston and you’ll get your answer. Here’s one vote for John Henry to go out and make some noise. Mr. Henry, Mr. Werner, please go out and sign this guy! The intangibles he’ll bring to Fenway will more than pay for his salary. With the loss of Victor Martinez, Adrian Beltre, and Mike Lowell, there’s plenty of payroll available to make this happen…. How to Become a Web Presence? If you read my last blog post on 1990’s Sales vs. 2010 Sales, you learned a term called “Power”. Power is achieved when you have developed a reputation of being an expert. Good Question….here’s my view on it. Today’s internet availability gives each and every one of us the opportunity to develop “Power”. Of course, you must first have knowledge of your field, which you still have to earn the old fashioned way, with training, education, and most of all experience. Once you feel you’ve achieved your personal “TEE” (Training, Education, & Experience) level required for expert status, your next step is to create and then maximize your personal world-wide presence the internet gives each of us. In order to successfully achieve “Power” in your industry, your goal should be to have your name & profile show up on the first page or two of search engines like Google and Bing when a prospective customer searches for whatever product it is you may be selling or the industry you may be working in. A good way to judge your current level of “Power” is to do a Google search on yourself and see what the results are. If you gets lots of “hits”, great! You’re well on your way. Next, enter the name of one of your product lines and see if you personally appear on the first page or two. My Linkedin profile appears prominently when most of my products are searched, thus I have “Power” in my industry. If your profile appears under your product and industry, congratulations, you are doing something right and already have earned a level of “Power” within your industry. But remember…the SEO companies are constantly updating their searches, so even if you have “Power” today, without an ongoing social media strategy and plan, your “Power” could be gone tomorrow. If your profile doesn’t appear, then you need to begin a targeted effort to develop it. As I’ve previously stated, as a professional, you should already have your Linkedin profile established. Continue to update this profile AND work it! There’s a great spot on it where you can list your current activities which could include any new products you’re working on, projects you’ve completed, target markets you may be trying to penetrate, etc. When you update this field, it instantly sends an update to each of your professional contacts, keeping them current on your efforts. This tool is invaluable. I would suggest spending a minimum of 1 hour a day trying to expand your professional network as this is the easiest and most efficient way to spread the message of your professional efforts. There are an abundance of tools available to use on the internet but unfortunately, we as individuals, cannot possibly spend the time necessary to take advantage of all of them. In other words, it’s nice to know where all the ammo is in the war of information but it doesn’t do you any good if you don’t have the weapons to use it with. That’s where Social Strategy 1 (SS-1) comes in. Social Strategy 1 (SS-1), a division of ILD Corp., provides all the tools you need to manage your reputation and appearance across the internet. We have developed systems to constantly crawl the web, looking for mentions both of your own personal brand, but also those of your industry and even of your competition. Social Strategy 1 (SS-1) then creates a plan which allows you to focus your efforts on the places where you’ll gain the most benefit. Another great question! There are a lot of “crawlers” you can use to get info sent to you (Google Alerts is one) but Social Strategy 1 (SS-1) goes a step further than the competition. Social Strategy 1 (SS-1) not only utilizes multiple sources for information and aggregates them together in a snapshot for your review, it brings a human factor into the equation. The Social Strategy 1 (SS-1) product line has a team of analysts who can monitor, recommend action, and if necessary, even engage in actions to assist in building and preserving the reputation of your brand and products. Social Strategy 1 (SS-1) can be the tool you need to not only gain, but keep the “Power” I’ve been talking about. Once you’ve gained “Power”, you’ll start to see calls coming into your office with people looking to speak to you because they’ve seen your name on their search efforts and you must be the “expert” they been looking for. Remember, everyone wants to believe they make good buying decisions. They want to buy from someone who knows what they’re talking about. To see how Social Strategy 1 (SS-1) from ILD can help you develop and maintain the “power” to increase your sales, contact me @DaveHanron on Twitter or email me @ dave@davehanron.com and I’ll be happy to arrange a demo for you. “Sales”……What a vast term. Everyone knows someone who is in or at least has tried a “sales” career. However, very few of us know those who have been successful in making a true lifelong career out of sales. Has everyone read “Death of a Salesman”, a book written by Arthur Miller? The book is based on an aging salesman named Willy who was once successful but has seen his business drift away. Willy recollects the good times throughout the book, then phases back to reality and the fact that he’s lost his “personality” and wasn’t well liked any longer. Why did Willy lose his personality? Because he never adapted to changing technologies and ever-changing methods of achieving “Power” status. “Power” is the technique of building your professional reputation as a person of knowledge, being perceived as an expert in your field. People always want to listen to experts, and people who make buying decisions are no different. Back in the 80’s and 90’s, all the sales courses used to talk about terms like “close ratio” and “value of a sale”. The accepted process to achieving sales success was take your quota, whether it be monthly or annual, divide it by average value of sale, and that’s how many sales you needed to make to hit your number. Take your number of sales, divide it by your close ratio, and that’s how many proposals you had to make throughout the year. Figure your percentage of attaining appointments from prospecting, divide it in your number of appointments, and VOILA! That’s how many customers you needed to cold call…..sales is that simple, right? We all know the answer…..WRONG! Using this formula today, the results are often impossible to achieve based on this 20+ year old premise. There are only so many hours in the day and quite frankly, cold calling doesn’t work these days. Why? Because today’s Executive are often promoted from the most successful producers within a particular company. That is often the salespeople and thus today’s “Buyers” were yesterday’s salespeople. They know the old techniques as well if not better than you do and won’t be talked into a purchase using them. So how do we succeed in today’s markets? I say indulge yourself into the information and social media world, and build your reputation “Power”using all the tools available to you today. 2. Join Linkedin and build your profile. Linkedin is basically a Facebook for business professionals. The more connections you can make on Linkedin, the more “Power” your profile has. 3. READ…READ…and READ. Read all the sales e-letters and books you can find. Lots of people have great ideas and techniques (there are lots of “experts” like me out there) and you can pick up something new from everyone. One of the best courses I’ve taken over the years is “Cold Calling is a Waste of Time” by Frank Rumbauskas Jr. It’s about 120 pages + 2 audio CD’s. Lot’s of good stuff in this one. Here’s a link if you’re interested in it.. http://www.nevercoldcall.com/?10072 Trust me, this one is worth the small investment. Try using these techniques to help build your professional “Power”. Start building your “Power” and you’ll find prospects will be calling you, not the other way around. Before long, you’ll have more leads than ever before, without using 20 year old techniques….Welcome to 2010! Cold calls, prospecting, leads, qualified, close ratio, average value of sale....... these are all buzz words used in sales and sales management. But what do they really mean and how do they relate to sales success. Is the successful sales person the one who struggles each month to make “quota”, making hundreds of cold calls, only to be rejected hundreds of times? Can’t be much fun dealing with all that rejection….think of this, if you ran into a stone wall trying to knock it down, but failed, would you continue to do it hundreds of more times throughout the month? Probably not, as it would only beat your body up. Ultimately, doing hundreds of cold calls with no results does the same thing. Maybe not physically, but it sure does mentally! So, if cold calling doesn’t work, what makes the successful salesperson successful? Working smart, not working hard. (I’m by no means advocating sitting in front of the television all day or spending every afternoon on the golf course, but there is certainly a better way to spend your time than cold calling). The old adage is if you are a sales person not making your numbers, simply work harder and you’ll attain your goals. Not true. Working harder with methods that don’t work only leads to more poor results. In today’s digital age, the successful sales person must build his/her image to the point that the consumer reaches out to you, not the other way around. You must be perceived as an expert in your field, a person who the consumer WANTS to buy from. It’s been proven over time that 80% of sales take place on the first or second appointment. What does this mean? It means stop wasting time on old leads in your “Funnel” and focus your time on new, high potential clients. If you don’t close the sale by the 3rd contact at the very latest, move on to the next opportunity. Remember, regardless of what your sales manger may tell you, no one closes every deal! If you do nothing but follow that one simple piece of advice, your results will improve almost immediately. A sales person must develop a highly professional image, through the use of the tools available to them today. And there are lots of them available for free. Linkedin, Jigsaw, Zoom, are all great networking sites to name just a few. Take the time to develop your professional profiles on these sites and you’ll soon see the search engines picking up your name higher on the results pages. Be sure to include your industry’s “buzz” words to enhance the likelihood of your name being found by a potential client. If you stick with this plan, even work on developing your own professional blog (like this one) and try and create a following. Try spending a couple hours each weekend on the laptop, tweaking your profiles, updating your blog, and adding to your professional network. Trust me, it doesn’t take too long to get results. Soon you’ll be having potential buyers contacting YOU to buy, not the other way around. Today’s digital age is yesterday’s referrals on steroids. Try it out and then sit back and watch the sales results roll in.